Young children find these little critters so appealing. 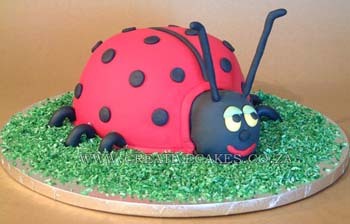 So if in doubt on which cake to choose for your pre-schooler, a ladybird is a lovely choice and will always be a great hit! A customer with twins (a boy and a girl) chose a ladybug cake for the girl and a spidercake for the boy as each insisted on their very own cake. It is such fun decorating a table with edible ladybug accessories which are fun and easy to make. Some suggestions I can offer are little ladybird cup cakes. Little vanilla flavored cup cakes delicately covered in green butter icing each with a single ladybug which is a replica of the actual birthday cake! Seeing the delight on the children's faces when they are each presented with this little ladybird party novelty is such a thrill to the mother of the party child. A true indication that your ladybird party theme choice has gone down really well with all the little ones and of course your child at his or her special birthday party.